Distinguished Conduct Medal, 27 September 1901. Mentioned in Despatches, 4 September 1901. David - The Moran group used to be in my collection. I moved it on several years ago after acquiring a similar Loyal North Lancs group at a very good price to a man who was wounded. Group to CS E T Connellan, Lincoln Regiment. DCM LG 31 Oct 1902. Medal presented by Lieutenant-General Hon. N. G. Lyttleton, KCB, on parade at Barberton, 20 June 1903. Edward Thomas Connellan was born in Sligo and attested for the Lincolnshire Regiment at Glasgow on 6 August 1891, aged 22 years, a clerk by trade. 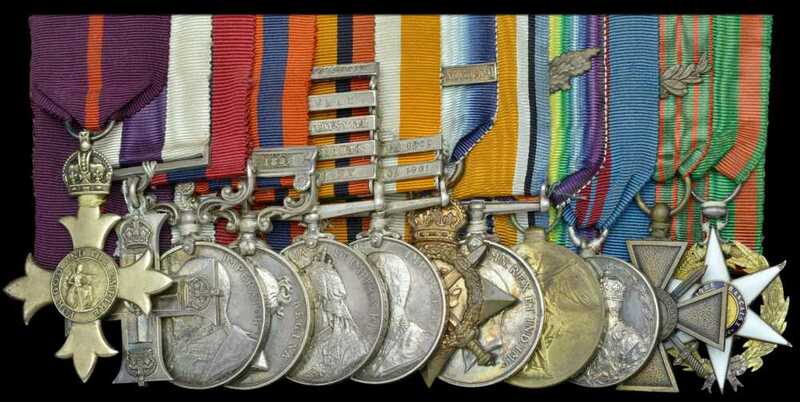 He was posted to the 1st Battalion and was promoted to Sergeant in July 1896 and to Colour-Sergeant in October 1897. 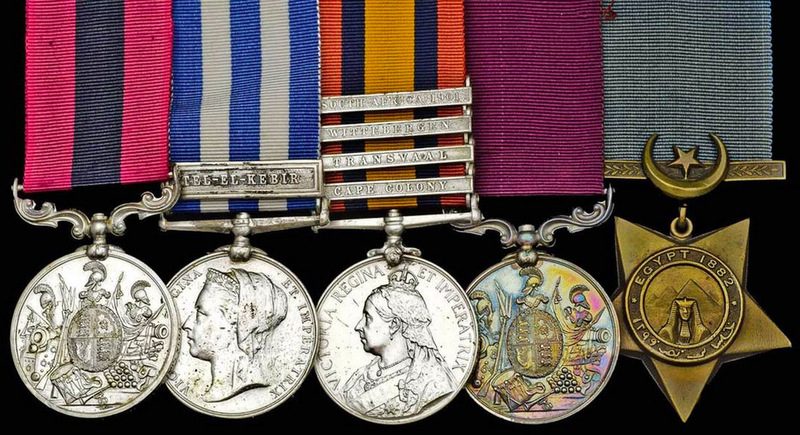 He transferred to the 2nd Battalion in September 1898, and served in South Africa from 4 January 1900 until 27 May 1904, being promoted to Sergeant-Major in December 1901. He was discharged on 5 July 1905. Sold with research including copied discharge papers and original Soldiers’ Small Book belonging to his son, Edward T. M. Connellan, No. 13748, Lincoln Regiment. DCM LG 27.9.1901 955 Squadron Sergeant Major D. McLaren (2nd Life Guards), 4th Battalion Imperial Yeomanry, since deceased. 955 Squadron-Sergeant-Major D. McLaren, DCM, served with the 2nd Life Guards in Egypt, before being attached to the 6th (Staffordshire) Company, 4th Battalion Imperial Yeomanry, for service in South Africa; he was severely wounded at Tigerkloof, 28.1.1901; and died of disease in Bethlehem, 21.3.1901. Edward Augustus Parker was born in Peckham, London about 1867 and enlisted in the Royal Welsh Fusiliers in December 1886. 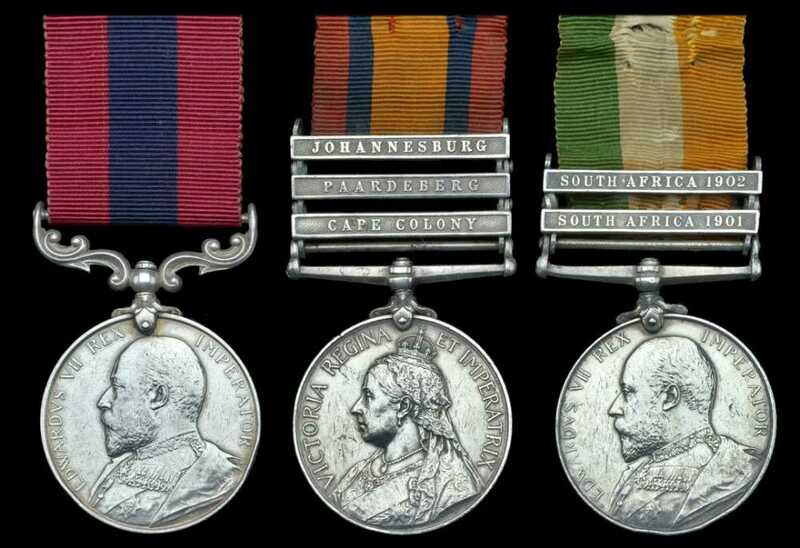 Having then served with the 1st Battalion in the Hazara Expedition of 1891 (Medal & clasp), he was appointed Sergeant-Major in October 1898 and participated in the operations in the Transvaal, west of Pretoria, including the action at Frederickstad on 20 October 1900. He was wounded on the latter occasion, mentioned in despatches (London Gazette 10 September 1901, refers) and awarded the D.C.M. 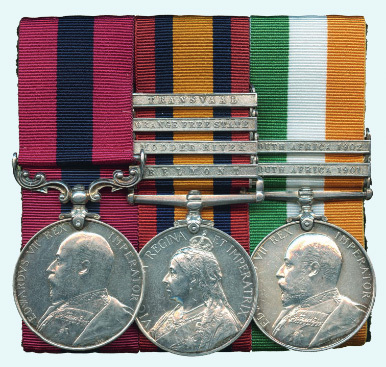 Subsequently commissioned as a Quarter-Master, with the honorary rank of Lieutenant, in the 1st Battalion in April 1904, he was a member of the regiment’s Coronation Contingent in 1911. Advanced to Q.M. & Captain in April 1914, Parker joined the 1st Battalion in Flanders in early October and was consequently witness to the severe fighting that followed. Following an abortive attack on Menin on the 17th, the Battalion - numbering 1150 officers and men - took up positions on the Broodseinde Ridge: within three days, as a consequence of severe enemy shelling and numerous infantry assaults, the unit’s strength was reduced to 200 officers and men. On the 29th, the Battalion was reinforced by 200 men and moved to new positions just east of the village of Zandvoorde. The Germans attacked in force on the following day, supported by 260 heavy artillery guns, and managed to get behind the Battalion’s line: it was all but annihilated, just 90 men answering the roll call on the 31st, among them Parker, the only surviving officer. He was mentioned in despatches (London Gazette 17 February 1915, refers) and awarded the M.C., both distinctions undoubtedly reflecting his ‘gallantry in the Field’, as cited in a reference written by Major-General H. E. Holman at a later date. He was invested with his M.C. by King George V at Windsor Castle in April 1915, one of the first officers to be so honoured. Parker was subsequently appointed to the Staff, initially serving as A.D.C. to the G.O.C. 7th Division (November 1914-May 1915), and afterwards as a Camp Commandant In IV Corps H.Q. (May 1915-February 1916), and Camp Commandant 4th Army (February 1916-March 1918). Then following a brief spell as Camp Commandant, Supreme War Council, he returned to his post in 4th Army and remained similarly employed until the war’s end. He was awarded the O.B.E. and five times mentioned in despatches (London Gazettes 15 June 1916, 4 June 1917, 7 April 1918, 20 December 1918 and 5 July 1919, refer); in addition he was appointed a Chevalier of the French Order of Merite Agricole (London Gazette 7 October 1919, refers), and awarded the Croix de Guerre (London Gazette 24 October 1919, refers). Parker, who had been advanced to Q.M. & Major on the recommendation of Lieutenant-General H. Rawlinson, G.O.C. IV Corps, in May 1915, was appointed Q.M. & Lieutenant-Colonel in November 1923, shortly before his retirement. He died in December 1939. A Magersfontein DCM To Pts Hamilton, 2nd Seaforths. James Hamilton was born in Edinburgh, where he worked as a painter, before attesting for service with the British Army on 8th September 1898, joining as a Private (No.6272) the Seaforth Highlanders. Hamilton was posted to the 2nd Battalion, and with the outbreak of the Boer War, then saw service in South Africa from 21st October 1899. 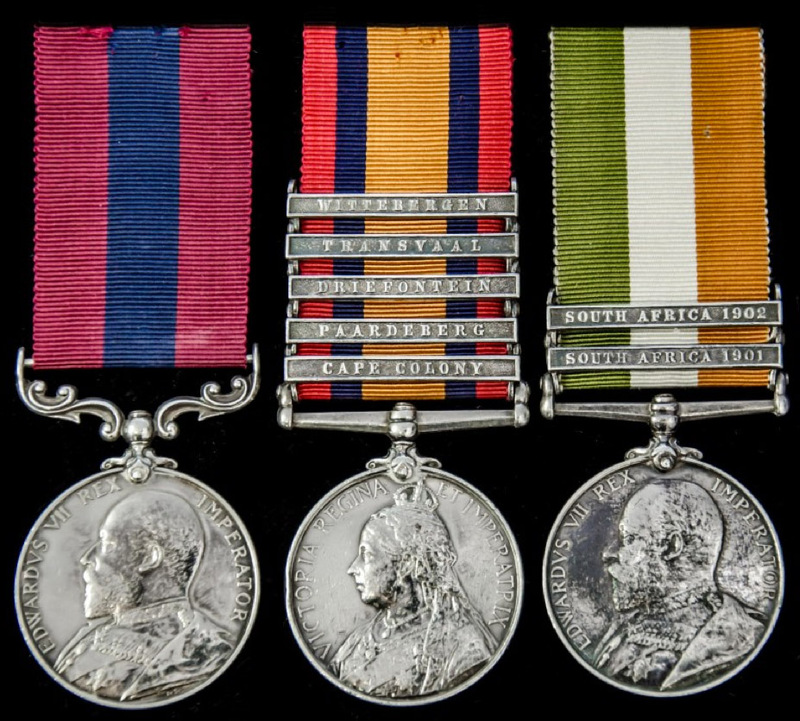 Present on operations in the Cape Colony and the Transvaal, and in action at Magersfontein on 11th December 1899, Paardeberg on 17th to 26th February 1900, Driefontein on 10th March 1900, and at Wittbergen from 1st to 29th July 1900, it was for his gallantry in action at Magersfontein which led to the award of his Distinguished Conduct Medal and Mention in Despatches by Lord Roberts’ in the London Gazette for 10th September 1901. The Battle of Magersfontein was fought on 11th December 1899, near Kimberley on the borders of the Cape Colony and the independent republic of the Orange Free Star. British forces under Lieutenant General Lord Methuen were advancing north along the railway line from the Cape in order to relief the siege of Kimberley, but their path was blocked at Magersfontein by a Boer force that was entrenched in the surrounding hills. The British had already fought a series of battles with the Boer, most recently at Modder River, where the advance was temporarily halted. Lord Methuen failed to perform adequate reconnaissance in preparation for the impending battle, and was unaware that Boer General De La Rey had entrenched his forces at the foot of the hills rather than the forward slopes as was the accepted practice. This allowed the Boers to survive the initial British artillery bombardment, when the British troops failed to deploy from a compact formation during their advance, the defenders were able to inflict heavy casualties. The Highland Brigade suffered the worst casualties, while on the Boer side, the Scandinavian Corps was destroyed. The Boers attained a tactical victory and succeeded in holding the British in their advance on Kimberley. The battle was the second of three battles during what became known as Black Week. The 2nd Battalion, Seaforth Highlanders experienced their first fighting of the campaign at Magersfontein, and suffered five officers and 53 other ranks killed, with 7 officers and 136 men wounded, and about 14 men taken prisoner. The Seaforth’s moved to the right of the Black Watch after the firing began, and pushed very close to the Boer trenches at the south east of the hill, a party of Seaforths actually got round to the east of the hill and ascended it from the rear. They were driven down, partly by the fire of the British uns, and were all either killed or wounded. Hamilton remained on service in South Africa through till 15th February 1903, having been appointed to Lance Corporal on 6th November 1902. Hamilton was then reduced to Private on 2nd December 1904, and transferred to the Army Reserve on 7th September 1905. Hamilton continued to re-enlist in the Army Reserve, and as such was mobilised on the outbreak of the Great War on 5th August 1914, being posted to the 3rd Reserve Battalion, Seaforth Highlanders on 8th August 1914, and served for the entire war at home, gaining several disciplinary actions against him for drunkenness. Posted to the 10th Officer Cadet Battalion as Staff on 1st April 1916, he was then posted to the 466th Home Service Company, Labour Corps on 10th August 1917, and to the 16th Service Battalion, Argyll and Sutherland Highlanders on 30th March 1918, followed by the 4th Battalion, Argyll and Sutherland Highlanders on 29th June 1918, and back to the 10th Officer Cadet Battalion as Staff, before being discharged at Perth on 2nd February 1919. Confirmed as his full entitlement.